Gaston’s Giant Bird (Gastornis gigantea) was a large, flightless bird that inhabited North America during the early Eocene. It was the largest and one of the last members of its genus and the largest terrestrial vertebrate in its ecosystem. 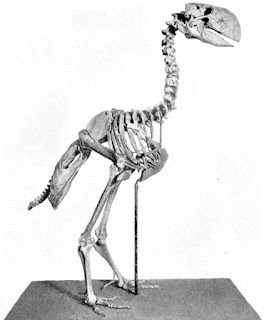 Mounted skeleton of Gastornis gigantea. Wiki. Gastornis has had an interesting taxonomic history in which two generic names were used in Europe and North America; Gastornis and Diatryma respectively. Coined in 1855, the genus Gastornis was named in honor of Gaston Plante who discovered the first fossils of the type species (G. parisiensis) in Paris, France, combined with the Greek word ornis, meaning “bird”. The now defunct name Diatryma was coined by American paleontologist Edward Drinker Cope in 1876 based on fragmentary material recovered from the Wasatch Formation of New Mexico. Diatryma was derived from the Greek word diatreme, meaning “through the hole”, referring to the large foramina that penetrated some of the foot bones. The similarity between the European and North American specimens was acknowledged as early as 1884 by American ornithologist Elliott Coues, but researchers debated the relationship between the two for nearly a century. Starting from the early 1980s, several authors began to recognize the great degree of similarity between the European and North American specimens and began to place both within the family Gastornithidae. Thereafter, scientists tentatively began to accept the synonymy between the genera pending a comprehensive review of the anatomy of these birds in 1997. Diatryma is now recognized as invalid, with Gastornis now taking priority. The scientific name of the North American species Gastornis gigantea, formerly Diatryma gigantea, may therefore be translated as “Gaston’s Giant Bird”. Fossils of Gastornis have been found in Paleogene deposits from the northern European countries of France, Germany, Belgium, England, as well as the United States, Canada, and China. During the late Paleocene, Gastornis seems to have been mostly restricted to Europe which at that time was a tropical archipelago similar to modern day Indonesia. During the early Eocene, when Europe became connected with the other northern continents, Gastornis appears to have migrated to North America and Asia where they gave rise to G. gigantea and G. xichuanensis respectively. These birds inhabited the tropical rainforest environments which covered the Northern Hemisphere throughout much of the Paleogene. 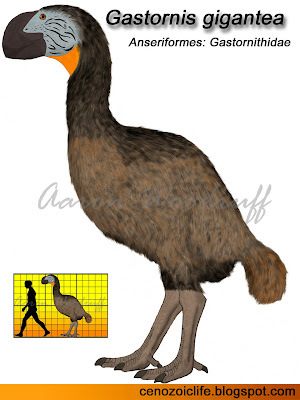 The largest of the genus, Gaston’s Giant Bird was still smaller overall than an Ostrich (Struthio camelus) in terms of linear measurements. However, the former was much more heavily-built with an estimated body weight of 175kg (385.8lbs), compared to the maximum 145kg (320lbs) for the largest modern Ostriches. The height at the top of the hips was about 130cm (4.3ft), and the height at the top of the head with a fully outstretched neck was about 200cm (6.7ft). The skull was large with a deep, laterally-compressed beak with nostrils positioned in front of the eyes and midway up the skull. The skeleton was robust with particularly short and massive vertebrae and a compact torso. The vestigial wings were highly reduced and probably would have been indistinguishable from within the long body feathers as seen in many modern flightless birds. A 2007 study has found the Gastornithidae to be an early offshoot of the avian order Anseriformes, the group which contains all of today’s waterfowl (ducks, geese, swans, etc). 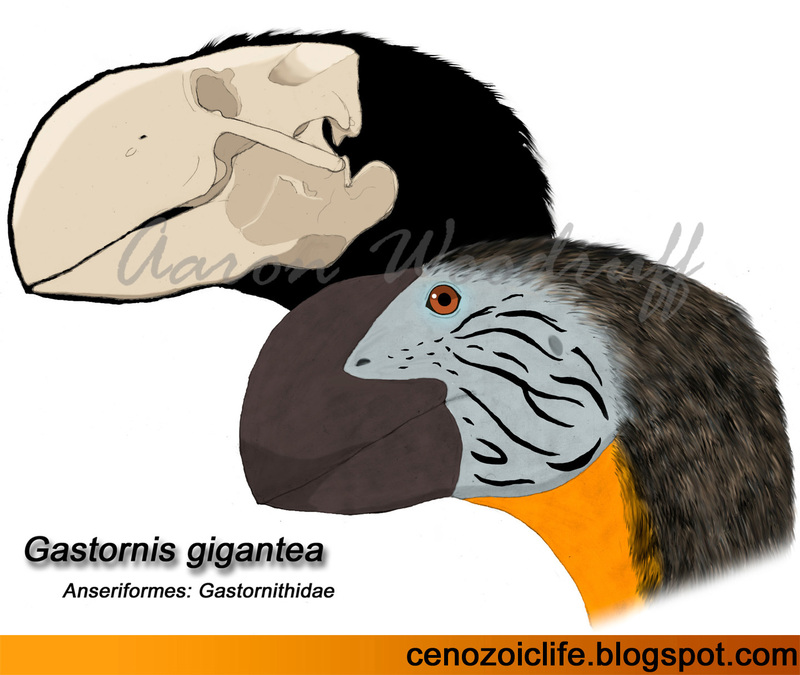 Although Gastornis fossils have been numerous and well-preserved, its ecology has been a matter of controversy. Past authors has suggested that these birds were herbivores. The traditional portrayal of Gastornis, however, has been that of a large carnivore which hunted the diverse array of smaller mammals with which it coexisted. This view of a predatory Gastornis was brought to life in the first episode of Walking With Beasts (2001), which depicts a female G. geiselensis terrorizing a forest full of bite-sized mammals. Those who favor the predator hypothesis site the birds’ massive skull, powerful jaw muscles, and large size. However, as I alluded to in an older blog post (here), the blunt and straight-edged beak of Gastornis was ill-suited for stripping flesh from carcasses. The eyes are set more to the sides of its head, an adaptation most commonly seen in prey animals that provides a wider field of vision while limiting the visual field overlap which predators use to judge the distance between themselves and their prey. Furthermore, each of Gastormis’ toes terminated in a blunt hoof-like claw, useful for gaining traction on almost any surface but not useful for pinning down its prey. perception which predators rely on when seizing prey. Wiki. Several recent studies have revealed further details about the diet of Gastornis. The jaw musculature has been found to be similar to that of modern herbivorous birds. Studies of the calcium isotopes in the bones carried out in 2013 yielded no evidence of animal matter in these birds’ diets, instead showing similar biochemical profiles to those known fossil dinosaurian and mammalian herbivores. Rather than being giant predators, Gastornis have been confirmed instead to have been a large browsing herbivores; more like giant land-parrots than terror birds. With their powerful, crushing beaks, they likely fed on a variety of hard-shelled fruits and seeds, as well as the woody branches of trees and bushes. Furthermore, adult Gastornis were the tallest animals in their ecosystems and thus would have had competitive advantage over other herbivores in their environments in being able to access plants that were higher off the ground. The predator niches of the late Paleocene-early Eocene in the Northern Hemisphere were instead occupied by terrestrial crocodilians (Pristichampsidae), creodonts (Oxyaenidae and Hyaenodontidae), mesonychians (Mesonychidae), and early carnivorans (Miacidae). Gastornis were the largest terrestrial vertebrates in Europe during the Paleocene, a time when the largest land mammals were no larger than tapirs. The structure of the Paleocene terrestrial ecosystem in Europe may have been similar to that of Madagascar prior to human occupation, which had been home to a host of small to moderately-large mammals with the largest terrestrial vertebrate being the giant herbivorous Elephant Bird (Aepyornis maximus). After Europe became connected to the other northern continents, Gastornis was successful in colonizing these new regions where, for a time, they remained the largest herbivores on the landscape. However, these birds increasingly had to compete with ever larger mammalian herbivores, some of which having attained the size of modern rhinos by the middle Eocene when these birds seem to have disappeared from the fossil record. Eggs attributed to Gastornis have been identified from parts of Europe, including southern France. These eggs were slightly larger than those of a modern Ostrich, with a maximum length of 17.8cm and a diameter of 12cm, an estimated volume of 1330.4cm3, and an estimated weight of 1.4kg when fresh. These were, in fact, the second largest bird eggs ever known, surpassed only by the Elephant Bird of Madagascar. On the basis of egg mass, the parent birds have been estimated to have been between 135.4 to 156.4kg. These estimates match the mass estimates for Gastornis and no other bird alive at the time were large enough to have laid these eggs.